Across the world the extent of corporate collusion raises a range of fundamental questions relating to the manipulation of markets and capture of the policy agenda by private companies. Little is known about the extent of such collusion in so-called developing countries, in Africa in particular. Based on recent research for ROAPE, Thando Vilakazi argues that the form and extent of collusion across much of the continent points to limitations of conventional ‘governance fixes’, namely competition law, to address private cartels in Africa. There is a growing body of evidence that collusion between competitors in the global economy has led to significant economic harm to consumers, with prices typically between 15% and 25% higher than would pertain under competition. A lot less is known about the extent of and harm arising from collusion in so-called developing countries, in Africa in particular. There are indications that there is widespread domestic and cross-border collusion in, for example, southern and East Africa. The related social harm is likely to be very significant given high barriers to entry and concentration in key industries, meaning that competitive constraints are lower and the likelihood of collusion is higher. Our own research points to high mark-ups from cartels in the cement and fertilizer industries in southern and East Africa, involving arrangements that have extended beyond national borders. The extent of corporate collusion raises a range of fundamental questions relating to the manipulation of markets and capture of the policy agenda by private companies. In the transition from generally state-led economies to liberalisation our case studies point to deeper concerns about widespread cartel conduct. This has to do with the fact that private companies, including large transnational corporations in these industries, have deliberately misrepresented their conduct, manipulated markets, and influenced the policy agenda to reinforce their market power. This includes lobbying for regulatory barriers which limit entry as part of industrial policies which favour established businesses. Importantly, the form and extent of collusion points to limitations of conventional ‘governance fixes’, namely competition law, to address the conduct. This is the case in various African countries where our case studies show that companies have become sophisticated in concealing the coordinated arrangements (including through secretive information exchange) while presenting a façade of competition. Competition authorities are now widely established in most countries on the continent, but they are constrained in terms of resources and capabilities to deter and uncover secret collusion and the elite interests which underpin it. The remainder of this blogpost highlights some of the key insights from our research in relation to each case study. The cement cartel in South Africa had effects which stretched across neighbouring countries in the Southern African Customs Union (SACU) area. A marketing agreement and several exemptions, which came into effect in 1971, laid the basis for the firms to coordinate distribution, supply and prices in the ‘local’ SACU market. The agreement was endorsed by the apartheid government as part of its policies to support mining activities. In South Africa’s transition to democracy and open markets in the 1990s, the government withdrew its exemption of the legal cartel to usher in competition. This was in line with the shift in the balance of power in the prevailing political settlement at the time. Unknown to the new government, the companies came together to reform the cartel a few years later, now under a secret agreement to manipulate the market. This occurred even as the firms publicly lent support to the government’s objective of increasing competition and building housing and infrastructure for the previously marginalised black population. Furthermore, the cartel continued despite the introduction of a new competition law and independent authority in the late 1990s, with powers to uncover and prosecute restrictive practices. This raises questions about the ability of governance institutions to address market power where it is deeply entrenched and reinforced by a legacy of elite ties and control of access to key markets and resources. The private cartel lasted until 2009. While the businesses portrayed a sense of competition, they had rigged markets to maintain agreed market positions and extract rents, including through the exchange of detailed information which reduced the need to meet regularly (and risk detection). The private cartel in fact led to substantial profits and prices soaring well above those enjoyed during the period of state-sanctioned coordination. Under the legal cartel, the firms were subject to scrutiny and had to justify their prices which played a role in disciplining the companies’ behaviour. Companies were required to make commitments to maintain a ‘reasonable’ level of prices and make investments, while the government ensured adequate returns to the firms. This is in contrast to the period after the legal cartel, where the new government had expected, under the new neoliberal economic policy paradigm, that firms would compete, and that competition would undermine rents. In reality, this was certainly not the case. The outcomes in the cement sector point to the fact that policy failures, including the inability to make markets more inclusive, can be shaped by the nature of elite alliances, rather than simply market failures or weak institutions. In the fertilizer industry, this is illustrated in the role that transnational corporations have played in distorting normatively developmental agricultural policies for profit (such as local inputs subsidy programmes), while fronting as ‘partners’ of government in making markets work. The various initiatives for increasing fertilizer supply to improve agricultural output and food security in Africa have been narrowly framed in terms of market failures in transport and local retail markets. This has diverted attention from analysis of the conduct of the main companies. It is no secret that there has been extensive collusion between leading global producers in the production and trading of fertilizer (especially for potash and phosphoric products). However, there is no mention of the need to address this in donor-sponsored strategies for a green revolution in Africa! These arrangements have harmed developing countries in particular, and undermined the objective of increasing access to fertilizer. There are also collusive arrangements that have operated between fertilizer importers in South Africa and Zambia, for example. In South Africa, producers and importers which previously enjoyed state support (also linked to the production of chemicals and explosives for mining), colluded to raise prices and divide markets in local supplies, and exports to Southern African countries. An illegal cartel arrangement lasted from 1996 to 2005 until it was uncovered by the competition authority. The main firms settled the cases with the authority, in exchange for reduced monetary fines, no doubt less than the economic harm caused. The conduct was concealed in the workings of the industry association, which, amongst other things, facilitated the exchange of detailed information to maintain the cartel agreement while presenting themselves as maintaining standards and quality in the market (and promoting consumer wellbeing). In Zambia, a local importer, Nyiombo Investments, colluded with a South African company (previously involved in the South African cartel) to rig tenders for supplying the government subsidy programme as well as to allocate markets and agree prices. The local investigation which uncovered the conduct was concluded by Zambia’s Competition and Consumer Protection Commission (CCPC) in 2013, with fines being levied for conduct which was estimated to have cost government around US$20 million. The companies were also linked to fraudulent relations with government procurement officials around tenders for the subsidy. These arrangements, as set out in our ROAPE paper, provide important insights into the factors that have contributed to the real market dynamics involved, including the role of local and business elites. First, companies have clearly manipulated supplies and controlled local markets through lobbying for regulations that protect their interests, and corruption. Second, government actors have contributed to shaping the market outcomes that harm consumers. For example, problems with the fertilizer subsidy programme in Zambia related to the ties between local (government) interests and the businesses, including in skewing tenders to ensure that preferred companies win (and no doubt share the rents). Third, the experience with subsidy programmes generally points to the fact that while companies have positioned themselves as partners of government in supporting smallholder farmers,in particular, the market outcomes are not reflective of competition. Instead they point to further entrenchment of market positions and rents to the exclusion of other local suppliers. In Tanzania, this pattern is illustrated in the investment made by global fertilizer giant, Yara International, in the Southern Africa Growth Corridor Initiative (SAGCOT) which was expected to reduce the costs of importing fertilizer. Instead, the programme has meant that Yara has cornered the local market, leveraging the fertilizer terminal facilities which ultimately only it can access to supply emerging smallholder farmers. The (high) level of prices relative to regional equivalents suggest that the benefits have not accrued to the local market. Control of key infrastructure by private interests, often with the support of governments – for example, Yara is understood to have received favourable terms in accessing land for the terminal – has served to lock out rivals without matching scale and influence. The powerful regional and transnational interests in fertilizer and cement remained relatively unchallenged even after the coordinated arrangements and collusion had been uncovered. It was not until the entry of significant regional rivals in both industries that there appeared to be a return to more competitive and pro-developmental outcomes. For example, the entry of Export Trading Group (ETG, a Kenyan company) in regional fertilizer markets has disrupted existing arrangements, and contributed to a reduction in prices in some countries and additional investments, even as Yara has bought up other challenger firms such as Greenbelt Fertilizers to retain its market position. In cement, the entry at significant scale of Dangote-linked cement companies in Zambia, South Africa and Tanzania has drastically reduced prices from around 2015. This impact has extended beyond country borders through exports of cheap cement into high-priced markets such as Malawi, pointing to the importance of trade policies which strengthen the integration of the region and industrial policies (with appropriate conditionalities) that attract large scale investment and players with the capabilities to undermine incumbents. Meaningful policies to improve economic outcomes for the marginalised poor in African countries need to encompass strategies for fostering local rivalry and the introduction of challenger firms. Such entry of local rivalry has disrupted the distribution of benefits and power which has sustained rents for insiders. In turn, incumbents have subsequently had to make investments in capacity and improved logistics to enable them to compete rather than simply handicapping rivals and manipulating the policy agenda in their favour. More importantly, the case studies in our research suggest a need to recognise the critical role that insider and business interests have played in skewing outcomes in many key industries. This requires an emphasis on understanding how collusion, and markets, have worked in practice and whose interests have been served. A critical understanding of the underlying arrangements and balance of power in key markets is an important part in explaining the outcomes observed and how these consumer harming practices can be avoided or minimized in future. It also requires recognition of the limited role that competition authorities can play in undermining arrangements between political and business elites which may have existed for many years. These arrangements may be entrenched in the workings of markets and reinforced by the sharing of rents and quid pro quos such as investment spending which in effect has strengthened the position of incumbents. The fact that the coordinated arrangements have stretched across national borders means cross-border enforcement by regional economic community competition authorities is critical in fostering cooperation between countries to identify collusion. 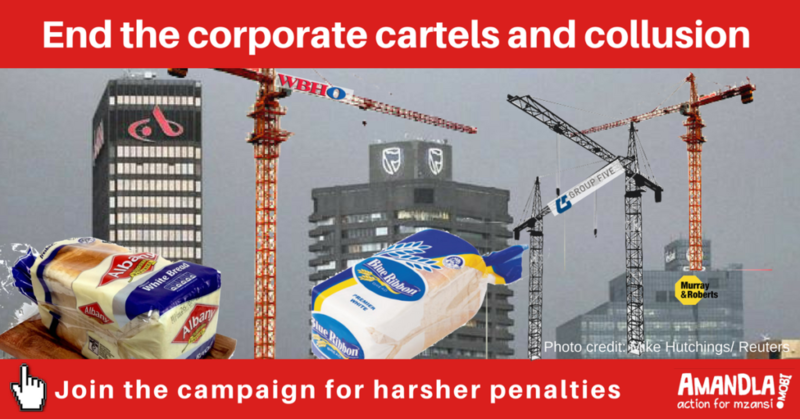 It is evident that arrangements that on the surface appear to be domestic agreements between companies, often mask extensive regional cartels which not only substantially harm millions of vulnerable consumers in major economic sectors. In small, concentrated markets with high barriers, the harmful effects of collusion in terms of economic development are likely to exceed any efficiencies that may arise from coordination, particularly where those rents are only shared by a handful of insiders. Thando Vilakazi is Director at the Centre for Competition, Regulation and Economic Development (CCRED) at the University of Johannesburg, specialising in research, teaching and advice on competition policy and industrial development issues. Featured Photograph: Image from a South African campaign against cartels and corruption (Amandla campaigns).